What should teachers do when their students are e-mailing in class? One response would be to confiscate the device and give detention, after a thorough scolding. Or you could do what George Burgess’s geography teacher, Will Williams, did when he found George emailing a developer- help him write the content for the first app- a Geography GCSE revision app- for George’s company, Gojimo. Started under the name of EducationApps, Gojimo is the UK’s number one, mobile revision app, providing students with study guides and quizzes from the world’s top educational publishers on their mobile phone or tablet. George began Education Apps, when studying at St Paul’s School, Barnes. Burgess was surprised that in an increasingly app-centric world, there were no decent educational aids available for the smartphone generation when he found no suitable app to help him prepare for his A-levels. 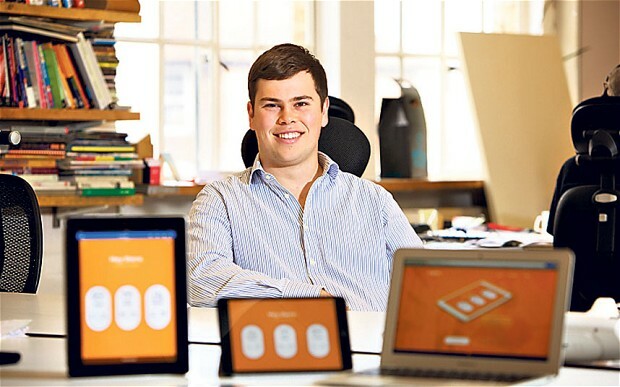 Four years on – having passed his A-levels, had a gap year, and joined and quit Stanford University in the meantime – the young entrepreneur has raised just over $1m (£604,000) to fund the next stage of his education technology business at the starting of the year. The fundraising was led by Index Ventures, backers of companies including SoundCloud, Etsy and Just-Eat. Other notable names now on the shareholder register include JamJar Investments – the vehicle of Innocent Drinks founders Richard Reed, Adam Balon and Jon Wright. “I got the bug for starting my own business before I finished school” he explains. At the tender age of 15, George was already a power seller on eBay and co-founded a film production business.“At school I was inspired by the entrepreneurial success behind the Innocent Drinks company” George added, and subsequently the three co-founders behind Innocent have also invested in his startup alongside Index. His company Gojimo’s previous apps (released under the EducationApps brand) include the BBC Bitesize revision guides, which were co-produced between the BBC and Pearson publishing. “Once you sign up one of the big publishers the rest tend to want to follow” says George. Education Apps was initially a third party developer – working for clients including BBC Bitesize and publishers like the OUP and Hodder Education – but now will focus solely on Gojimo, which will act as a platform for third -party content. George explained the idea behind the name Gojimo came from a branding agency. The ‘goji’ part represents the goji berry superfood and the ‘mo’ associates the brand with mobile. On the back of achieving 250,000 downloads in 12 months when his venture went under the umbrella branding of EducationApps, Gojimo will now take the form of an all-in-one mobile learning platform. Their main source of revenue will be in-app purchases of textbooks and revision guides, which will be split between the publishers and Education Apps.A later version will also allow teachers to track student progress, send assignments and even issue quizzes in the classroom. Now, the wide-eyed seventeen year old’s dream has been realized. He has negotiated content deals with the world’s largest publishers, including Pearson, Oxford University Press, McGraw-Hill Education and Hodder Education and established strong relationships with Apple and BlackBerry, ensuring apps were promoted on the home screen of both app stores. A member of BlackBerry Alliance Partner and BlackBerry Elite Developers team, George emphasises that he is an entrepreneur rather than a techology whizzkid.